Brown University's Graduate School offers 51 doctoral programs and 33 master’s programs, including those of the School of Engineering, the School of Public Health, and the School of Professional Studies. Brown has a friendly scale and collaborative culture. With 2,600 graduate students and more than 700 full-time faculty members, Brown offers excellent academic training and mentoring within a supportive environment. Explore the fields of study offered and Brown's distinctive training opportunities. If you are interested in an academic program, please feel free to contact that program’s Director of Graduate Study. Application deadlines vary by program. Is it for you? 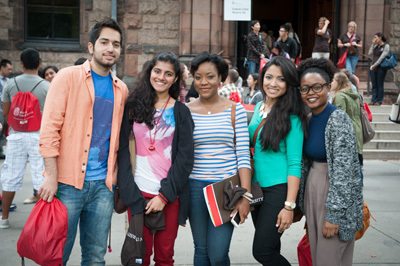 Brown students are distinguished by academic excellence, self-direction and a collaborative style of learning. Faculty members pursue their own research and scholarship while remaining deeply committed to teaching both graduate and undergraduate students. Learn more about the environment, student accomplishments and opportunities.